After socks come shoes, right? I have what I consider to be a modest collection of footwear–two pairs of dress shoes (brown and black), one pair of casual shoes, two pairs of boots, and a pair of trail shoes. Oh, and a pair of sandals. Now climbing shoes–that’s a different story. I am sure any specialty shoe is expensive–be that ballet toe shoes or high end running shoes. Climbing shoes are no exception and can easily run $150 a pair. And it’s pretty easy to burn through the rubber on those shoes too. The good news is: you can get shoes re-soled for around $40 or $50. There’s a point of diminishing return, though, on resoling shoes more than once (or maybe twice). So as it is with many things, eventually climbing shoes need to be retired. So what does one do with old climbing shoes that are too worn out even to resole? 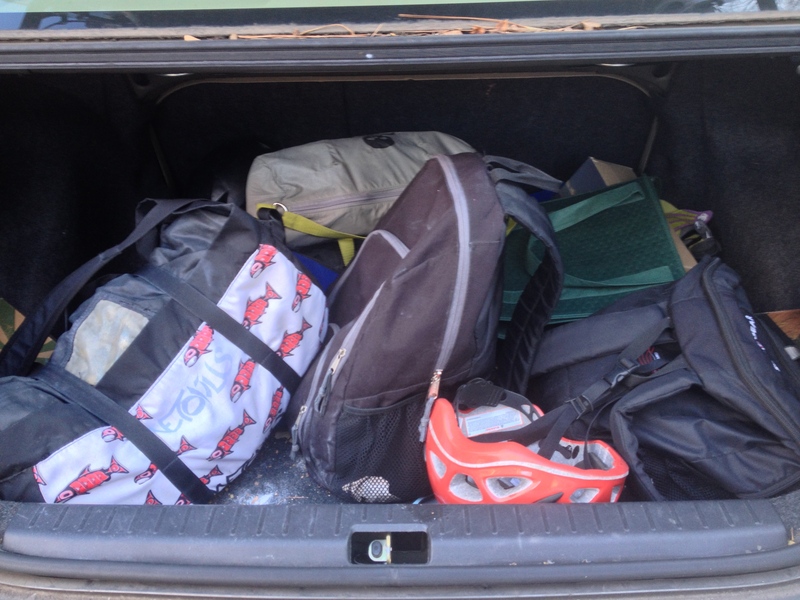 Well, if you are me, you just pile them up in your trunk, just in case… well, just in case I’m not sure what. Maybe I think I will someday need to send a small army of climbers up a rock wall in worn-to-the-toe shoes. Or maybe I feel that somehow I’m being wasteful by tossing out something that cost so much, even though they have clearly been put to good use. Who knows. But the truth is: I have no good reason for holding onto these things. But hold onto them I do. 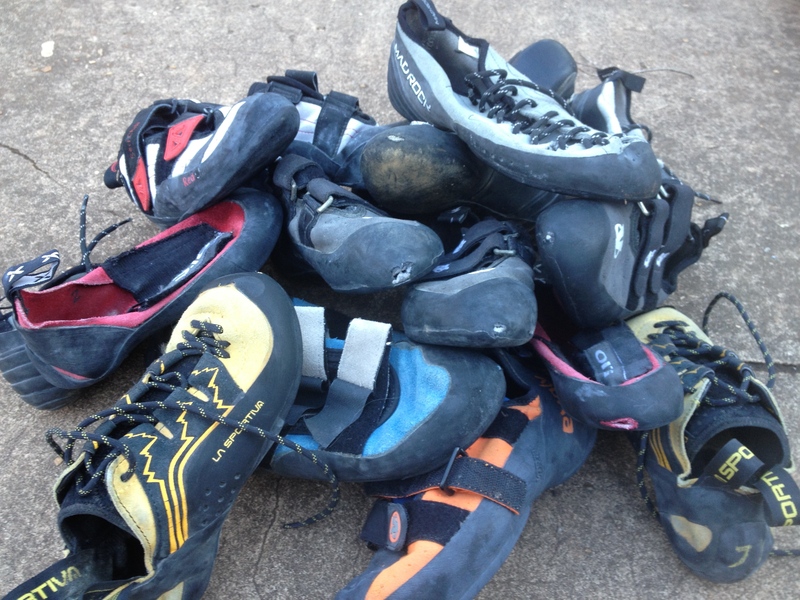 So today, I tossed out 17 climbing shoes–yup, 8 and a half pairs. In addition to everything I chucked, I did actually find two pairs that were in good enough condition to pass along to my son’s climbing coach as spares to keep on hand. A third pair were in good condition, but too small for one climber in the family and too big for another. I’ll hold onto that pair for a clearly defined future use, once a little girl’s foot grows into a size 4. And there was an added benefit to discarding all those shoes today: I cleared out my trunk for the first time in a long time, which had become home to an accumulation of random detritus (a popping cork from a fishing trip I took six months ago, an REI receipt, etc. not to mention a few climbing shoe boxes). So no heavy philosophy today, no major insights. 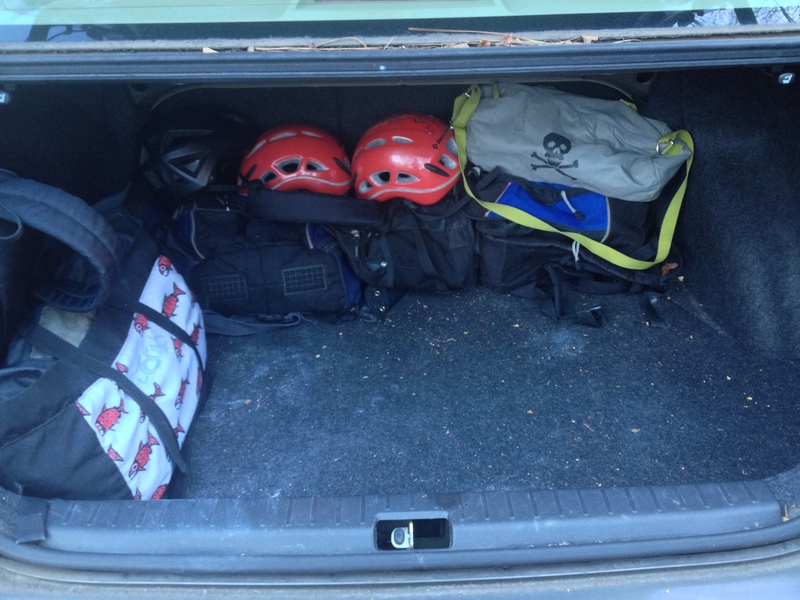 But I now actually have room in the trunk for storing things other than old shoes and trash! This entry was posted in Uncategorized and tagged clothing, clutter, simplify. Bookmark the permalink.